Novak Djokovic is the career leader in prize money earnings on the ATP tennis World Tour. With more than 120 million U.S. dollars in prize money earnings, he is only one of three players who have made more than 100 million U.S. dollars from prize money in men’s professional tennis. The only other two are Roger Federer and Rafael Nadal. Even though the top players like Djokovic, Nadal, and Federer earn millions every year in tournament prize money, they generate even higher income from off-court earnings such as endorsement and sponsorship deals. In the twelve months from June 2017 to June 2018 Roger Federer generated about 65 million U.S. dollars in income from endorsements alone, while his prize money income stood at 12.2 million U.S. dollars. Therefore prize money accounted for less than 20 percent of Roger Federer’s income in that time period. 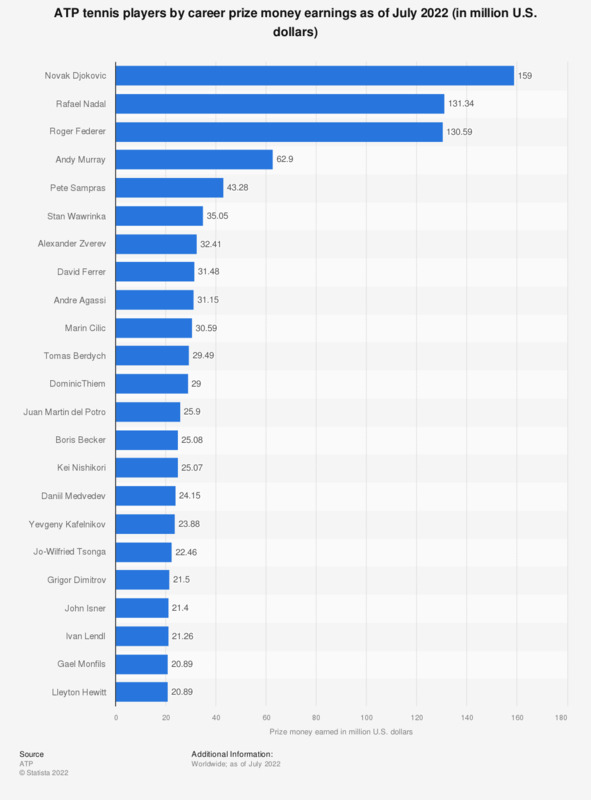 Somewhat not surprisingly, the three players topping the career prize money list are also the top three in terms of Grand Slam tournament wins and considered to be amongst the greatest tennis players of all-time. As of March 2019, Roger Federer has won 20 Grand Slam tournaments, Rafael Nadal has 16 titles, and Novak Djokovic has 15 Grand Slam titles to his name.